As part of the above-mentioned project commissioned by the Agency for Cultural Affairs, we have continually dispatched an expert to Nepal. From September 6th through 14th, Mr. Yamada, associate fellow of this Institute, conducted an on-site survey. This time, he mainly surveyed the finishing specifications of the internal walls for the buildings around Aganchen Temple in Hanumandhoka Palace, Kathmandu, the restoration of which is planned under the guidance of Japanese specialized technicians, while taking photos to provide an official record. The wall surfaces of the buildings have been repeatedly painted since their construction, changing the paint materials. 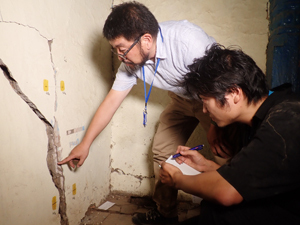 Therefore, the finishing layers damaged by the earthquake were carefully peeled off one by one with a working knife to investigate the history of the internal wall specifications in each room. Toward the future restoration, it is necessary to examine whether the former painted surfaces should be preserved, as well as to consider the specifications for restoration painting. The results of the investigation will be utilized as information for making such decisions, giving us important clues to clarify the history of the buildings repeatedly rebuilt. 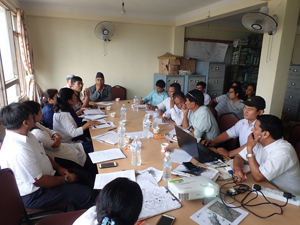 On the other hand, on September 10th, he attended the workshop for the preservation of historic settlements in the Kathmandu Valley hosted by Kirtipur Municipality that has historic settlements inscribed on the World Heritage Tentative List, and suggested the items that require urgent attention for the conservation of historic settlements. Responding to this suggestion, the Mayor of Kirtipur, local administrative staff having jurisdiction over each historic settlement, and personnel from the Department of Archaeology of the national government held enthusiastic discussions with one another. Although there are still a lot of tasks to be completed before a proper system for conservation of historic settlements can be established, this workshop allowed the members to anticipate its realization.